One of the toughest things about digital marketing is that the industry is constantly changing. Anyone who’s tried to set up a Facebook business page, then gone to update it 6 months later will know the frustration of trying to find something in the same place as it was before. The nature of technology lends itself to frequent, and sometimes jarring, modifications. And this remains true for the best practices when it comes to social media strategies in general. The recommendations we gave you in 2018 are certainly not the recommendations we’ll be telling you in 2019. This is part of the reason social media is such a tough nut to crack, even for industry professionals (that’s us). It requires regular research, education, and testing of your audience to stay on top of what actually works. You’re lucky, then, that we’re on top of our game here at EZY Marketing and have done all that research for you. Trust and authenticity have always been a priority, but it will become more important than ever. Facebook algorithms are updating to filter out the noise and catch spam, and other social platforms are following suit. You should create posts that are honest, conversational, and limit your use of hashtags (2-3 on FB, Twitter, and LinkedIn, 10-15 on Instagram). With that theme of authenticity, we’ll see a rise in the popularity of “spur of the moment” posts. Things like stories instead of curated feeds will reign supreme. Followers are interested in seeing behind the scenes content. Are you a restaurant? Snap a quick video or boomerang of a dish being put together. Are you sales based? Grab a picture of your team having fun restocking shelves. Do you offer services? Take a selfie with your client during a meeting! There are tons of ways to communicate more informally with your followers – and you’ll see a boost from it in 2019. Live Video. You knew this one was coming. While this isn’t necessarily a “post”, it will be integral to supporting your reach and engagement for 2019. This is the ultimate form of “in the moment” content. You’re actually bringing your followers into a live feed. 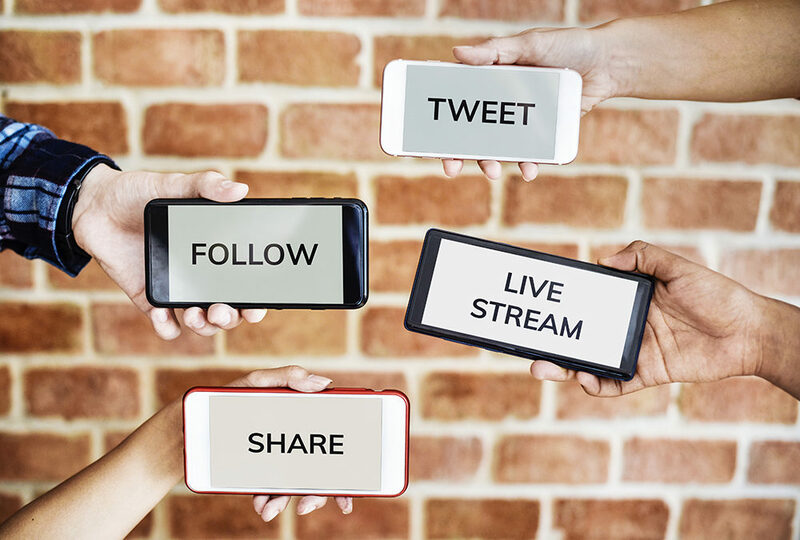 Don’t worry if you don’t have many live followers watching, statistics show most live videos are watched after the fact. Gather some FAQs, chat about your industry, show how your team works… there are tons of ideas to support your live video streaming dreams. While we’re discussing videos (come on, you knew it was going to be a major theme), it will be important for you to craft your videos in vertical feed format. This does limit you, since YouTube wants that wide screen version, but any posts on social should be formatted for best viewing on a mobile device, in an active scroll, or in a story format. If you’re not doing in the moment or live feeds, any curated videos should be shot in wide screen and then cropped to vertical for use on Facebook, Instagram, and Snapchat. Keep this in mind when setting up your shot – multiple crops for cross-platform promotion is the name of the game! We know. This is a lot to take in. As a small business owner, we know you might not have the time to implement all of these recommendations, or perhaps you don’t know where to start. That’s where we come in! If you find you need a personal consultation for your business, or are looking for upkeep services to maintain your social media presence, please reach out to us. Social media isn’t always “EZY”, but with us, it can be!